Tikal is the greatest of the Mayan ruins in not only all of Guatemala, but all of the Mayan world. 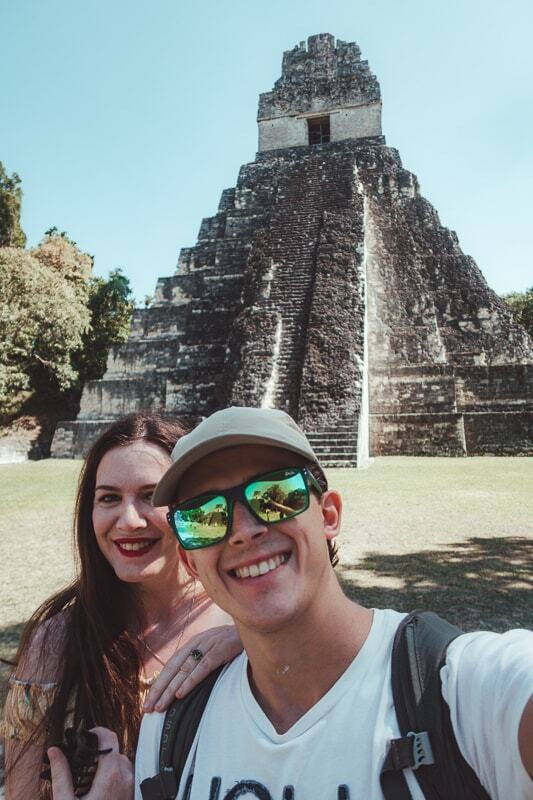 It’s a MUST SEE on any Guatemala backpacking itinerary and below I’ve created the ultimate guide to visiting the Tikal Mayan ruins. 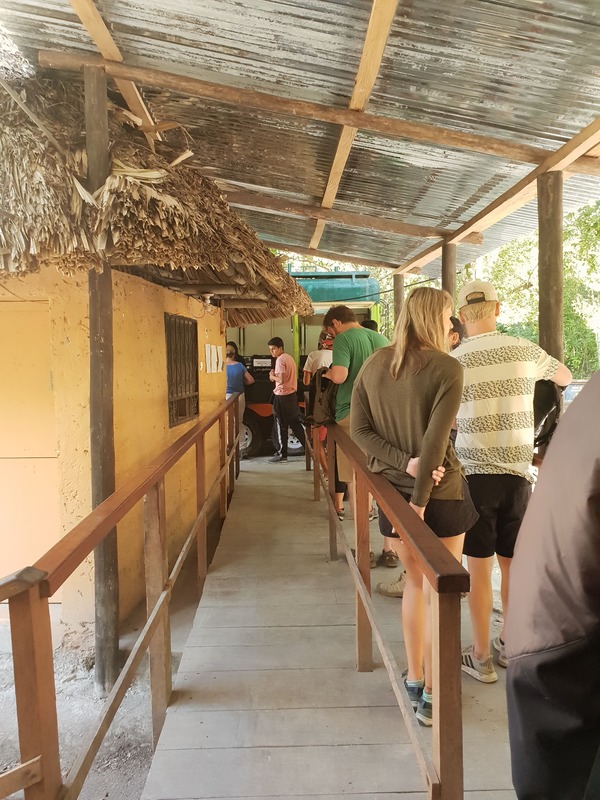 It should answer all of your questions, such as how to get to Tikal, how much you should pay and whether or not you need a guide. So just keep reading to learn everything you need to know! 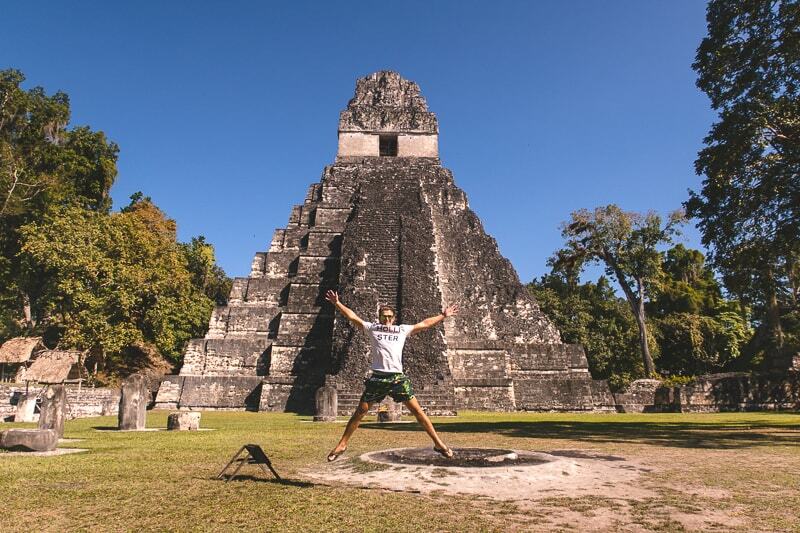 The Tikal Mayan ruins are without a doubt the most popular tourist attraction in Guatemala. It’s no surprise why. The Tikal Mayan ruins are a world heritage site and became one in 1979. They are located deep in the jungle area of the Peten region and was once the most prosperous city and capital of the Mayan Classic Period. It was the beating heart of the Mayan Empire. The first archaeological records of Tikal date back to around 1000 BC, which is crazy! Tthe Tikal empire began to thrive at around 300 BC. The Mayan people were peaceful people, and they found no records of weapons in the Tikal ruins. The area is MASSIVE and actually only some of it has been recovered (A small section). It’s thought that there are over 3000 temples in areas still not discovered. But archaeologists don’t want to recover everything as they want to keep the history a mystery too. 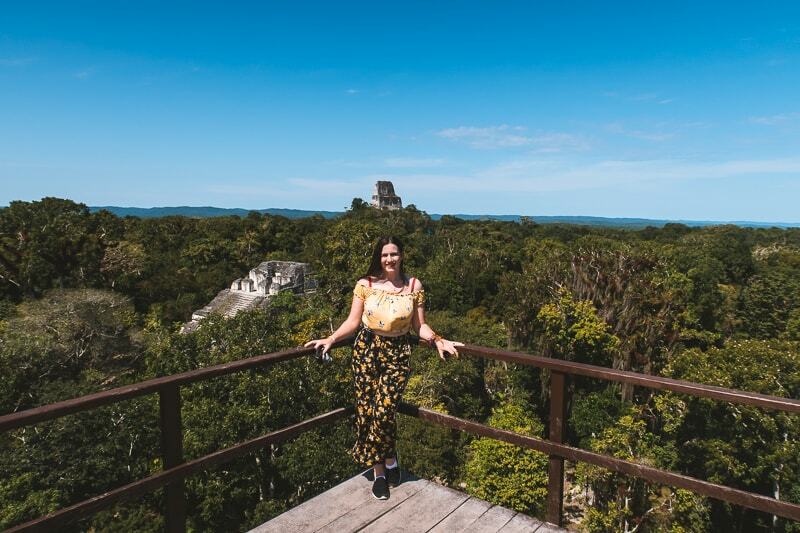 During your visit to the Tikal Mayan ruins, you’ll actually be greeted with a few viewing platforms, and one will show you the vast forest and jungle that surrounds you. It’s also fun to walk around the ruins and you’ll discover ruins that have overgrown which is pretty cool. Below are some fun facts about the Tikal Ruins that I learnt on my visit. Tikal was a Mayan superpower and the largest in the Mesoamerican era. This is the term used to describe the Mayan empire, i/e Central America and Mexico before the Spanish conquered it in the 1500s. Were told on our tour that there was no human sacrifice in Tikal, and that things were pretty peaceful, but the internet says otherwise. According to Culture Trip, “ritual human sacrifice was practiced by the Mayans, and documentation of sacrifice has been found here. Sacrifice with bow and arrow is depicted upon the walls of Tikal Temple II, and another structure depicts a human sacrifice in which a person is bound to a stake and is being disemboweled.”So someone was lying: probably our guide. After all, when was any civilisation ever truly peaceful? The Tikal Mayan Ruins are located in Tikal National Park which was created in 1966 and was the first protected area in Guatemala. Tikal was the capital of the Mayan world and today 4 Mayan books exist from the library. 100,000 people lived here (well, roughly) but thanks to recent historical discoveries we now know that number would have been a LOT larger. It was likely drought and deforestation that lead to the demise of the Mayan civilisation living in Tikal. But, we don’t know for sure. Okay, now we’ve covered the background and facts on the amazing Tikal Ruins, it’s time to get going!! The Temple of the Great Jaguar rises 154 feet (47 m) high and is a funerary pyramid dedicated to Jasaw Chan K’awil. He was entombed in the structure in 734 AD and the pyramid was finished about a decade later. At the top of the pyramid is a temple with three rooms and a corbel arch. Temple of the Mask was the first temple to be completed by Jasaw Chan K’awil as a monument to his wife. However, no tomb was found. The pyramid stands 125 feet (38 m) high and faces the rising sun. Temple of the Double Headed Serpent is Tikal’s tallest pyramid standing 230 feet (70 m) high. It was built by Jasaw Chan K’awil’s son Yik’in Chan Kawil in 740 AD to commemorate his father. Temple of the Inscriptions was built in AD 766. 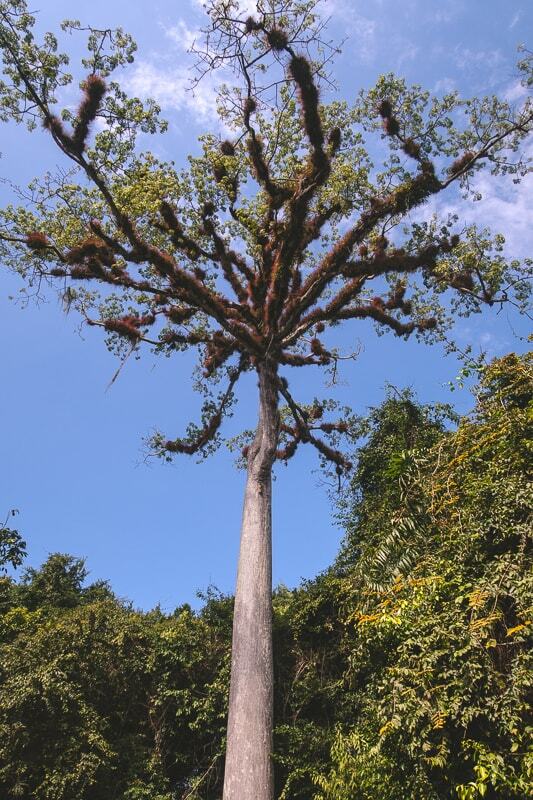 It is known for its 39 feet (12 m) high roof-comb, which has one of the longest inscriptions found at Tikal. Remember, these are just some of the temples you can expect to find at the amazing Tikal Mayan Ruins. Most people base themselves in the beautiful island of Flores in Guatemala. It’s only around an hour-30 minute drive to Tikal and it’s super easy to get there. It really is a beautiful location and there are lots of amazing things to do in and around Flores. So naturally it’s a perfect base! If you’re looking for somewhere to stay in Flores, I can recommend the Hotel Villa Del Lago. This is where Bradley and I stayed. It’s around £35 per night with taxes and includes air conditioning. Which is useful because it can get very warm in Flores. It doesn’t include breakfast, but they do a great breakfast at the property for 40Q that you can eat before your trip to Tikal to get you started for the day! From Flores it’s easy to get to Tikal. There are lots of shuttle buses that run to and from the ruins. It costs around 70Q for your journey there and back. You can probably haggle, but that tends to be the price. Most guest houses, hostels and hotels can arrange the shuttle for you, or you simply go to a tour agency and buy your ticket. Shuttles return at 12 pm, 3pm and the evening after sunset. We personally opted for the 8am. 4am was too early for us (We were moving quick throughout Guatemala and actually wanted to sleep haha). And the sunset would have been nice, but it was just as good during the day. Also, Tikal isn’t overly popular (which is a good and bad thing). I don’t mean popular in the sense that people don't want to visit it, but instead it’s because Guatemala’s tourism isn’t that high at the moment. This means you can get more of the ruins and jungle to yourself, and on some occasions you can feel like you’re the only one there. It’s SUPER WARM at the Tikal Mayan ruins so bring sun cream. We booked our tour with Penten Travels and had no issues with them, so I can recommend them for you! 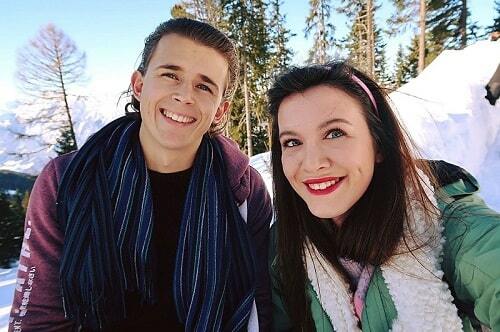 Bradley and I visited in January and it was hitting 30 degrees. There was no rain, so I think this was a pretty nice time to visit. Apparently, peak time is around March and April, but be aware that temperatures then hit 45 degrees so….up to you! 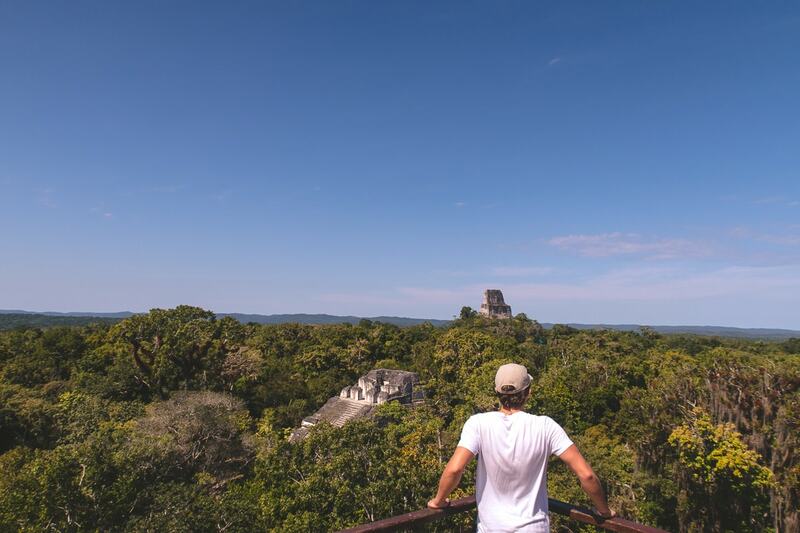 Now, when you visit the Tikal Mayan ruins, you have the option of seeing the sunrise or sunset. We had some friends that visited the sunrise, and I have to say, their photos did look amazing. If you don’t fancy getting a super early bus, you can actually stay up at Tikal too. There are a variety of hostels, or you can camp. So this may be a better option for you. You can find the best price deals on properties in Tikal here. The is the same case for the sunset, if you don’t fancy going later, you can stay up there. I imagine the sunset is amazing when the sky is clear, which it often is. But do monitor the weather so you are not disappointed. The cost of entrance to the Tikal Mayan ruins is 150Q, which is totally worth it. The PARK IS MASSIVE, so it’s well worth the money you pay. If you want to visit at sunrise or sunset, you pay an extra 100Q (about $13) as you are not “meant to be in the park” as it’s out of hours. You pay this additional fee at the entrance as well, if you don’t arrange it beforehand. Please Note: YOU NEED A PASSPORT WITH YOU TO BUY ANY TICKETS. Please dear god, do not forget your passport; or you can’t get in and your journey will have been pretty pointless. This is the ticket office. Remember your passport! 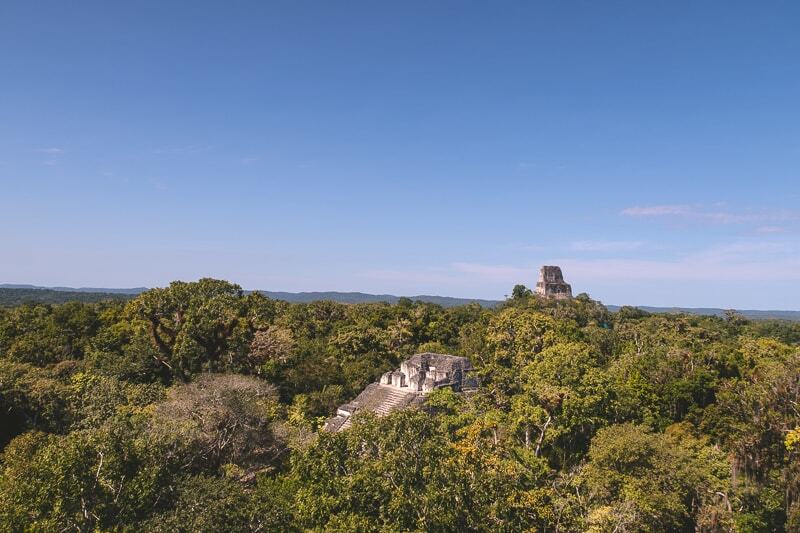 Can you climb the Tikal Mayan Ruins? Tikal Temple IV (which was the tallest pyramid in the Mayan world). This is also known for being the Star Wars temple because you can see the The Millenium Falcon shooting out from the temple peaks as it appeared as part of the rebel base during “A New Hope”. The views are well worth the climb. You can also climb the Central Acropolis (Great Plaza) area (no longer temple I). Another viewing point is from Temple II that gives you the iconic view over the jungle. To be honest, I don’t want to give away the experience of all the temples. Leave some element of surprise for when you get there and visit yourself! Be aware about sun exposure at the top, so wear suncream. Climbing the ruins is of course fun, but do respect them and don’t leave rubbish etc. When you enter the park you can get a map to bring around with you, or before you enter there is a massive map that you can take a picture of to help navitage. You get views like this! Guides at the Tikal Mayan Ruins are super cheap, and you can have an English speaking or spanish speaking guide. It’s super cheap (We paid $5, but you can get it even cheaper than that) and it’s worth it. 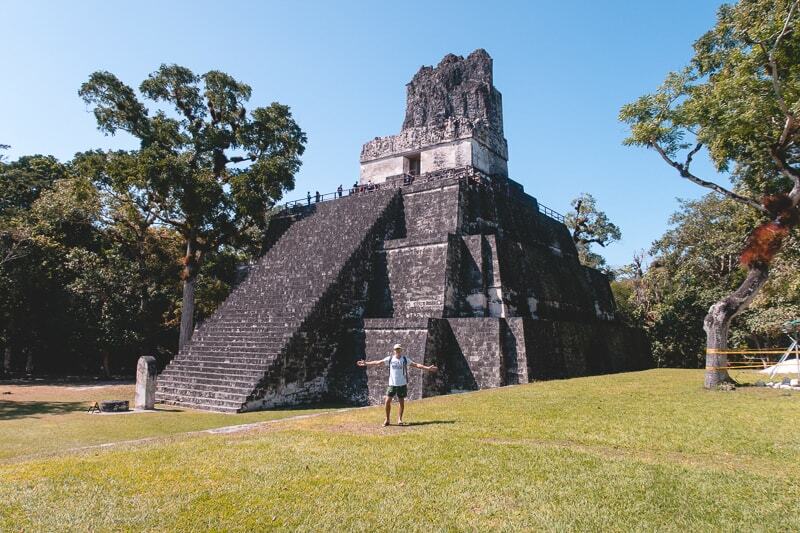 The Tikal Mayan ruins are massive and there is a lot to learn, so it’s worth having a guide to navitage and having someone to ask questions and find out information from. These is the most significant Mayan ruins in the world, so I think it’s worth paying a few extra dollars and actually learning about them. Yes, you can discover them on your own, if you’re not interested in Mayan ruins. But I don’t see the point is seeing these amazing ruins if you don’t want to learn about the history. They are official guides, you get a fine if you try to guide and your aren't official. If you take a guide for the 8am shuttle (which we did), you will need to take the 3pm shuttle back! Any earlier won’t give you enough time. This is a question often asked, and it’s a worthy one. Guatemala does have a “high crime rate” and is indeed one of the highest in Latin America, but RARELY does this affect tourists. 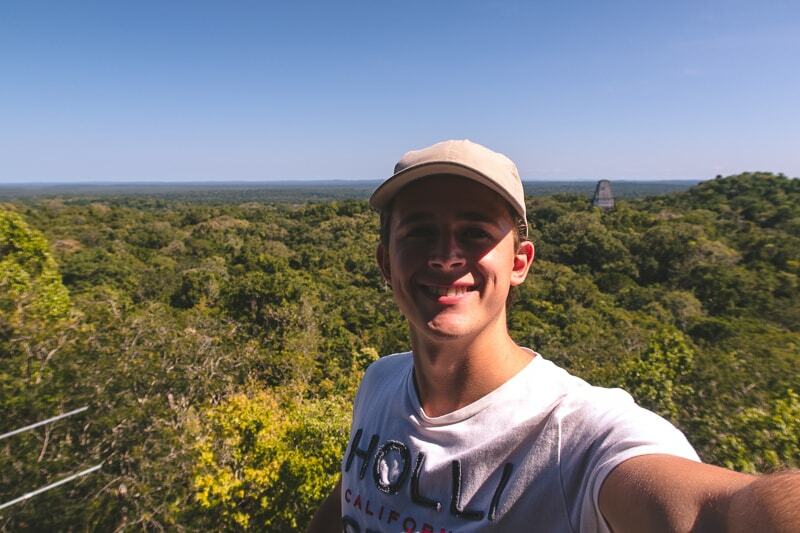 I have to say, Guatemala for me and Brad felt like one of the safest countries in the world. We never felt threatened and we didn’t have a single issue with scams, robberies or anything. People were more than friendly and we walked around at night in many areas without any issues. The exception to this would be Guatemala City. As with all cities, normal precautions should be taken. So yes, it’s very safe for visitors. Do not let anything deter you from visiting beautiful Guatemala. Easily one of my favourite destinations in the world. London has felt far more dangerous than Guatemala ever did. Below I’ll list some tips I learnt on my trip to Tikal, that will hopefully make your visit pleasant and stress free! Most hotels offer a “packed lunch” to bring with you to Tikal. This is because the 2 cafes that are there are overpriced. So it’s a good idea to bring something with you. If you don’t bring a packed lunch, don’t worry. Brad and I bought a sandwich at the cafe outside the entrance (not the one in the visitor centre) and the sandwich was 25Q. Inside the park there are lots of different little picnic spots that you can sit and relax under the sun beside a ruin. It’s cool! There will be people selling drinks and beer in the park in coolers if you want something cold. Bring water into the park with you. Toilets are free, clean and there always seemed to be toilet roll. Bring a travel tripod with you if you want to get some really cool pictures with friends or as a couple. They don’t take card anywhere in Tikal, so bring cash (yes, thin includes the main entrance!). If you want, you can visit the little market stalls after you’ve finished exploring and buy some gifts. If you want proper and nice coffee (espresso, cappuccino etc), there is a coffee stand beside the visitors centre and beside the little market that sells coffee. It’s about 20Q for a Latte and they’re delicious (I always need decent coffee haha). The park is open from 6am til 6pm. When leaving for your shuttle, leave the main ruins at least 30 minutes before departure; don’t underestimate the time it takes to walk back to the entrance. You cannot fly a drone at Tikal. If you do opt for staying up at Tikal, then there are other ruins you can visit within close proximity. The most well known is Uaxactun. It’s about 12 miles from the main Tikal sight. There is also another new temple that’s been recovered known as “El Mirador”. You can get here via a 5 day hike in the jungle. It takes two days to get there, an overnight stay and 2 days back. You might even meet some Jaguars on your way! During your walk you’ll get to discover even more secluded ruins. Uaxactun is also home to the 8th largest Pyramid in the world! Something to tick off the bucket list. We didn’t do this, but I did find a cool article that gives you good information on how to do it yourself here! If you’re leaving Flores, then it’s time to make your way to the amazing Lanquin & Semuc-Champey. Another thing you cannot miss when backpacking Guatemala. You can visit the Tikal Mayan Ruins even if you’re not staying in Flores, or Guatemala in general. Day trips are offered from Belize Antigua and even Lake Atitlan. It will be a fairly long day, but you can still fit it in a tight travel itinerary! Also, fun fact..LiDAR sensing technology helped scientists to virtually remove the jungle canopy around Tikal and discover that the already massive Mayan city was actually part of a Mayan megalopolis. This was in 2018 and it means Tikal wasn’t just a small city, there was a massive world of other districts and cities around it. This means the whole Mayan world is being reconsidered with the number of people, etc and maybe we will know the real reason for the fall of the empire. It’s very interesting and amazing to be so close to such relevant and inspiring history! 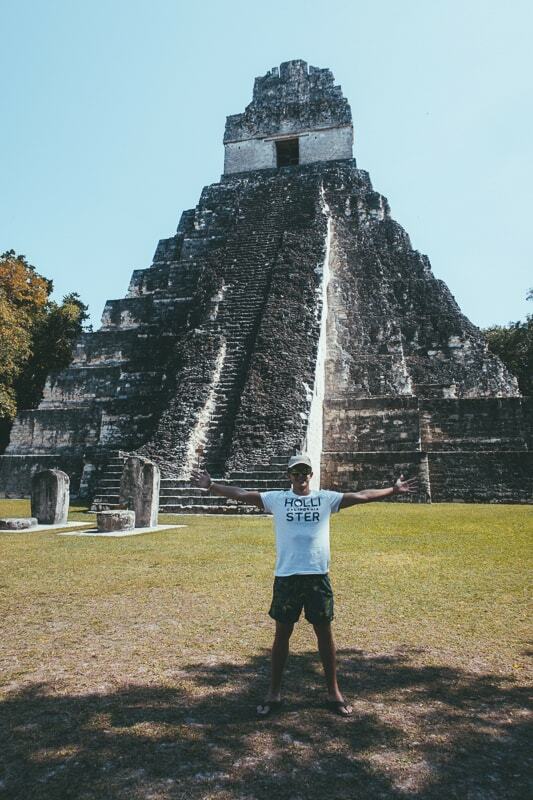 So, visiting the Tikal Mayan Ruins is an amazing experience and if you only want to visit one Mayan ruin site in all of Central America, then this should be the one. Well, this is the CAPITAL of the Mayan world. This is where it’s at, and you should not skip Tikal. 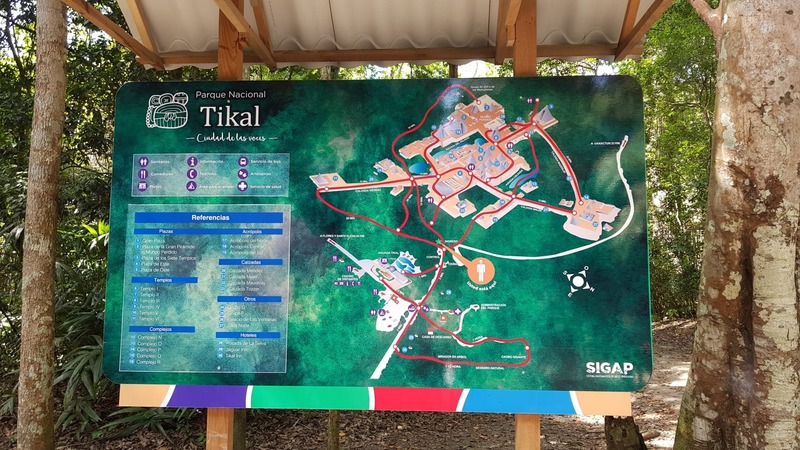 I hope you’ve enjoyed my guide to visiting the Tikal Mayan ruins and I hope this helps make planning your trip a little easier. 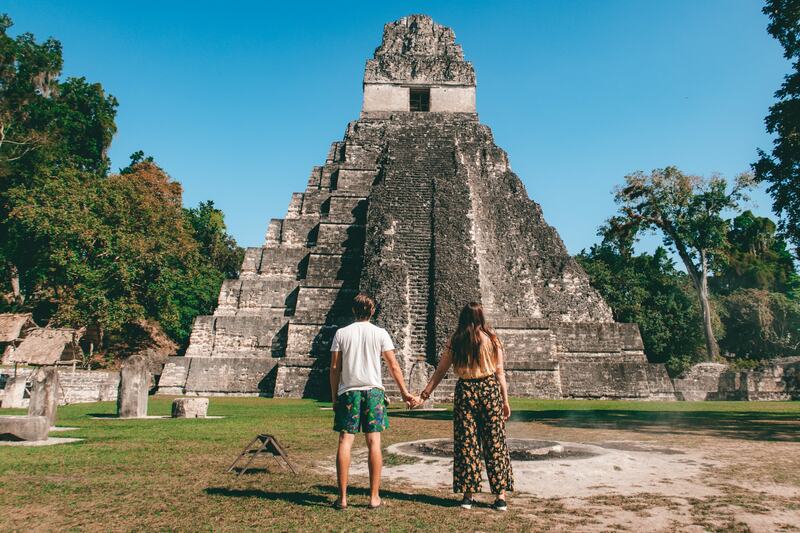 How about taking a tour to visit Tikal?